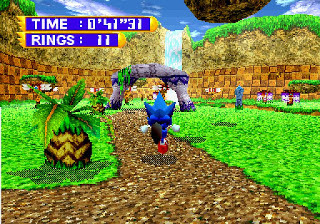 Sonic Jam is a compilation of the blue hedgehog's 16-bit adventures, along with a new 3D hub world. It includes Sonic the Hedgehog (1991), Sonic 2 (1992), Sonic 3 (1994) and Sonic & Knuckles (1994), and each features a number of options to cater towards different audiences, such as Easy which omits various levels. Normal alters the level design slightly to increase playability, such as adding a slew of air bubbles in Labyrinth Zone to cut-back on underwater deaths! It's a neat idea that enhances replayability, and it's nice that the Original mode is also available for those who want an untouched experience. The ability to Spin Dash in the first Sonic game is a smart idea too and it stops you from having to reverse to build up speed! The emulation is pretty faithful, although there are some strange SFX choices, such as the more emphatic explosions when Dr. Robotnik is defeated, and Sonic's muffled jump. There's also minor screen tearing and severe slowdown (mainly in Sonic 2 and 3) when the action gets too fast. The lock-on ability of Sonic & Knuckles is still present though to open features in the other games. In the cool Sonic World 3D hub, you wander around and take part in simple, yet entertaining missions, such as popping balloons and locating Miles against the clock. The frame-rate is rock-solid throughout and the draw distance is respectable, but interestingly the slow-paced action and open-world platforming is more akin to Super Mario 64 (1996, N64). I like this exploratory aspect, but it's intriguing to ponder whether the Saturn could have handled the speed of a fully fledged 3D Sonic game. This mode also includes some great fan service through old commercials, concept art and music. Sonic Jam is an excellent compilation of the blue hedgehog's 16-bit outings, but it's hard to recommend it over the Mega Drive originals due to the rampant slowdown. The real draw is the 3D hub, and while it's admittedly lacking in content, it does provides a tantalising glimpse into what could have been for Sonic's cancelled 32-bit outing. 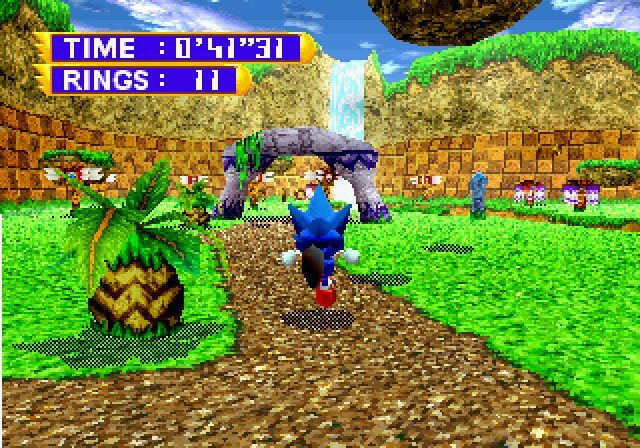 Random trivia: Sonic World eventually proved to be the testing ground for Sonic Adventure (1999, Dreamcast).